The long skinny pole in the center of the photograph to the left is the top of the crane at Plaza Towers Elementary School, Moore, Oklahoma. I was standing one block west of the school where those seven children died when I took this picture. The devastation of the neighborhood around the Plaza Towers is beyond comprehension. My brother Brett and I walked west from the Command Post near Warren Theater on I-35 through a Moore neighborhood that had been destroyed. After traversing a city park strewn with debris, we crossed the Little River. The park and river are where the homeless in Moore, Oklahoma usually live, and we both had the feeling we would find bodies as we walked. Normally, we would not have been able to cross the river, but the debris so clogged the water flow--debris that included dozens of destroyed cars-- that we walked across the river without getting wet. 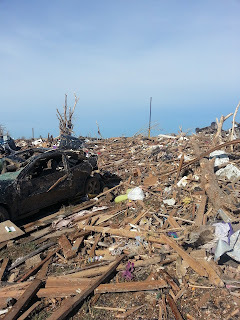 On the west side of the Little River, about a half mile west of Warren Theater, we hit ground zero of the Moore tornado. People are still not being let in, and search and rescue teams are continuing their work. Moore city officials are overwhelmed trying to get the infrastructure repaired. We walked with Oklahoma Natural Gas teams as they sought to shut off gas that continued to seep from broken pipes above concrete slabs. The area was still extremely dangerous. Twenty-four bodies have been found, but I can't imagine that there will not be additional deaths uncovered when debris begins to be cleared. One particular house we passed had been cleared by search and rescue three times (you can tell by an orange X, a silver M, and a Green ^). Surprisingly, there were a number of dogs in houses where there were no people. Animal control and additional police were helping get the animals to shelters. Of course, the focus was on finding people alive, and in one particular house we passed, search and rescue found a man alive - the third time the house was cleared. we were able to place twenty-one 7,000 watt generators with law enforcement, search and rescue personnel, fire crews, and rescue shelters, all of whom were in need of portable electricity. 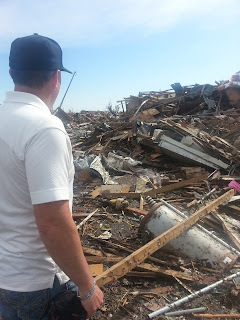 Paul Baker's Emrick's Moving and Storage (a member of Emmanuel) continues to collect donations at his office on South Van Buren in Enid and will be transporting the materials to the people of Moore. Go by tomorrow and drop off your supplies at Emrick's. The greatest needs are batteries (C and D), gloves, flashlights and trash bags. Paul will get the materials to Moore. Money for fuel to run the donated generators for weeks has been given by an Emmanuel member. Five Moore families who lost homes and/or loved ones have received cash through Emmanuel's benevolence fund. Our young people will be coming down Friday or Saturday to help clear debris. I saw the Enid Police Department guiding traffic at 4th Street and Telephone Road, just north of the Command Center. Donations have flooded into Moore from around the world, but the people of Emmanuel Enid (and Enid proper) have made a huge impact in this city. I have not seen much from social media or watched television the last 24 hours, but Brandy Ester, a nurse from Emmanuel, sent me a text quoting NBC Television newscaster Harry Smith, who when interviewed by Brian Williams said, "If you are waiting for the Federal Government to help it's going to be a while, but the Baptist men will get it done tomorrow." Amen, Harry Smith. After seeing the huge Baptist Disaster Relief Tent in the parking lot of FBC Moore, Oklahoma, and the crowds being fed by Baptist men (and women), I echo Harry's sentiments. There are all kinds of heartbreaking stories from the disaster zone in Moore. The story of the seven children who drowned in the basement of their school has broken all of our hearts. The most difficult rescue for a couple of the men with whom I spoke was pulling a eight-year-old boy out from under his dead mother, a boy who had been trapped underneath his mom who had shielded him from certain death. During the May 1999 Moore tornado I found a little dead baby in a field. I almost stepped on the child, thinking she was a doll. Every step I took today through Moore brought back that memory. I thought for certain I might find something similar, but thankfully I did not. About 6:00 p.m. tonight, after walking hours through the devastation of Moore, Oklahoma, my father sent me a text asking "Wade, have you seen this?" He included a photo of John Piper's tweet (see above). Honestly, I thought maybe Piper's twitter account had been hacked. Though I believe in the sovereignty of God, I can't fathom how somebody like John Piper can allow his theology to trump his love. People who have lost loved ones to death during a great wind don't need theologians to quote Scripture about people dying in a great wind. They need our love. Thank goodness Oklahoma is filled with people who let their love trump their theology. I thought about closing today's post with a picture of a woman in tears as I handed her cash to help with her short term expenses, cash that came from the people of Emmanuel Enid. She burst into tears and couldn't even say "Thank You" because of her emotions. My brother took the picture and then hugged her as I told her that the people of Emmanuel Enid just wanted her to know that there are people in Enid who cared for her and her family and were praying for them during their time of loss. I am not going to show you the picture out of a desire to protect Kaylee's privacy. But as I close this post after a very long day I just want to say "Thank You" to all of you who have helped the people of Moore through your love, your prayers, and your finances. Let us always allow our love to trump our theology. It is the only way people will know we belong to Christ. Well-written, Wade. You have a real heart for Jesus. Excellent and written with love. Thank you Wade! God bless you and the good people of Emmanuel for helping those in need in this crisis.
. . . but he had to know his tweet would be very controversial just at a time when folks really needed to focus their attention on helping the victims, and not concentrating on him. His timing was more inconsiderate than his tweet, I think. To all: Heading back to Moore early am. Unable to respond to comments. Thank you for your prayers for the people of Moore. 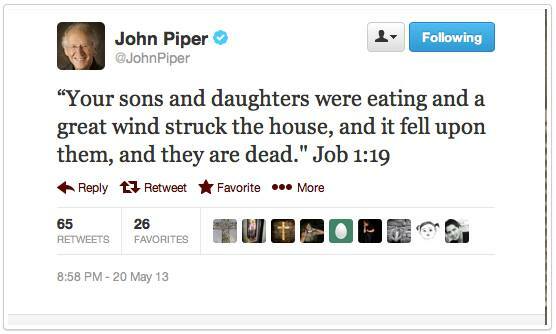 As much as I disagree with John Piper, maybe—just maybe he wanted to show that tornados existed in the days of Job—considered to be the oldest Book in the Bible. Wade, I have a dream—I thought it would be heaven, but maybe I’ll meet you for the first time in Moore, OK. This is a false dichotomy ie love and theology. So Wade if Bill Marriott walks up to a Moore tornado survivor and hands them an amount twice as large as you and does in the name of Jesus Christ does love really trump theology. Love is not ultimate. God and His Glory are ultimate. Both in His Mercy and in His wrath. Like John Piper says God is enough! I don't know what makes me cry more, the scale of the disaster, the love of Christians (including your church), or Piper's callousness. And I am literally crying as write this from the other side of the world. Okay, would someone mind explaining this chain of messages to me. I don't understand the point/intent of Piper's Scripture reference and I don't understand Wade's conclusion that Piper is some how substituting theology for love. Any offer of reasoning for either of their comments would be appreciated to this apparently "slow" thinker. I think it was the FEMA director, but it could have been another official I saw on tv yesterday. He was saying if folks across the nation want to help, the Salvation Army is always a good place to donate but off course to really help Moore contact the SBC as they will get it done. And I'm seeing another response that is awesome. There will be mention that Oklahoma is heavily Baptist, and then absolute awe at how well those that lost all worldly goods seem to be handling this. There are some comparisons to disasters in other parts of the country and comments about those Oklahoma people just "having something others don't." Amen to that! We out of OK are seeing those of you in the area really let your lights shine for Jesus! Praying for all of you! I have a third grade grandchild and was preparing the child's dinner when I heard that for a time they thought an entire third grade class was missing. I sobbed outloud and felt like I was hit in the stomach. Didn't take me a minute to activate our prayer chain out here for Moore, and we aren't stopping yet! I just sent this email to your son and husband. The Red Cross in Bonham, TX says they’re not ready for any help in Moore, OK yet. I’d like to know who to contact (phone) if the youth of Fannin Co. could help this Friday and Saturday (May 24-25). Our Association Director, Jerry Christopher, said he would email the churches to find their interest. The Association has a 30 x 70 tent we could camp in. I have a combination generator/welder, lights, etc. Is it possible we could help your youth in clean-up? I believe helping others brings both parties closer to the Lord. My home phone is 903-961-2326, and cell 903-227-0701. Time is precious--if you could help get a reply from Wade, I’d have more information to inform those on this end. I hope you don’t mind me putting your husband’s poem here. I think it’s wonderful. But mirrors shout back that I'm now an old man. But inside she's still beautiful, youthful and grand. Is like spring flowers sprouting in life's autumn time. That our summer together was not privileged to find. And she to me with joy and sometimes pain it's true. The young man and woman that keeps shining through. You realize the truth of this poem more when its gone. I'm not sure I totally 'get it' either RRR. From what I gather you are suppose to understand where Piper's mind is going, and (Piper and Crowd) assumes you know the 'context' of this scripture according to their understanding of it. Not understanding his context - and I don't know HOW you are suppose to just KNOW the context - in using Job is NOT inapprorpriate resource to address human suffering. WELL that is according to Denny Burk anyway. To most people I guess you are suppose to be a mind reader, and understand WHY he felt this line of scripture was approriate. What's more telling is you are wrong if you don't know his context, and sadly you need to repent as well if you take it the way he didn't intend on you taking it. You see you are to think the best of them, and I guess they don't have to. I think because they see people are attacking them, and don't feel the need to understand their upset. Your suppose to understand them instead. Confused yet? lol I know I am! The context is that sometimes God allows natural evil to occur even in the lives of the most righteous people. If one is remotely familiar with the story of Job, they will know that the verse is describing the calamity brought about by Satan as a means of proving Job’s righteousness. This passage is a wonderful example of how we, if we are a believer, should respond in great and terrible tragedy. There are many more examples of what you are suppose to 'gleam' from the tweet. So I assume from their response if you aren't a biblical scholar - it wasn't meant for you anyway. Now, I think I understand what Wade is saying....lol I think, but I'm still don't understand the Piper deal! The mind is still swimming there! SO I could be all wet! The people in OK that just experienced this awful tornado don't need to have scripture - especially those you are suppose to stop and wonder the heck the context is - given to them instead of what is truly needed at this moment. The story of Job may help later on - in a different circumstance - but right now what they truly need is help, love, compassion, empathy. They need a shoulder to cry on, an ear to hear. They need those to mourn with. 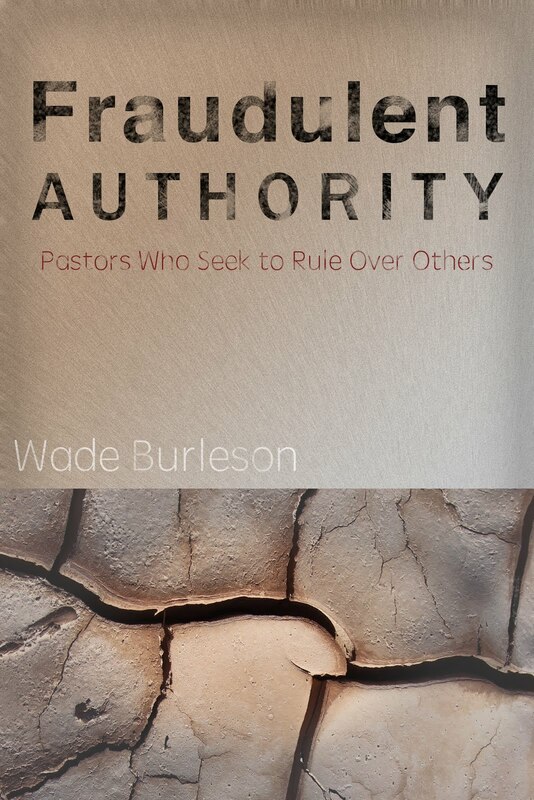 They need people to pray for them from a distance, because we may not be able to do what Wade and his church is doing. They need contributions, clothes, well wishes, etc. They need us to SHOW the Christian Love, and not talk about some wind that struck the homes, fell upon them, and they are dead. People struggling with the images on TV don't need to reminded that God's allows natural evil to occur even in the lives of the most righteous. lol for goodness sakes! We are concerned for the people, the town, the state, etc. We are mourning for them, and we need others to mourn with us as well! I truly feel it effects everyone! Most people want to help, and having scripture quoted at you like this? It's not the time nor the place that, and from me personally? THEY should know THAT! lol and I will throw in a context for Piper and gang - won't let them guess - the scripture above should tell you there is a time NOT to do things as well. In other words, Get with it! Show CHRISTIAN LOVE - don't talk about it! Its the wrong SEASON for that! I think you hit the nail on the head! Wrong scripture at the wrong time. It was a time for grieving, love, support, etc. 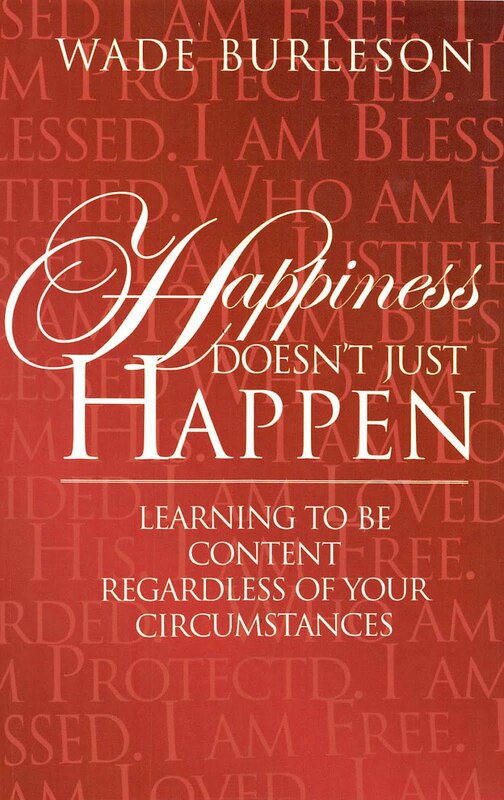 not a **** happens! Perhaps as much grace will be shown for John Piper, here, as is being shown in Moore, by Oklahomans and others. Perhaps Piper can receive my outpouring of grace, but at the present time, it's correction he needs based on his inappropriate response to this tragedy. What a joy to read your blog today, and to see the action being taken by the brethren at Enid, who. I have absolute confidence in the sovereignty of God, but no matter what the context of anyone's quote, the apparent lack of sensitivity to the needs of others appears to be a rather common unhealthy attitude. There have been many Christians who have made categorical statements regarding God causing particular catastrophes. How can they make such claims with the supreme confidence that something was,or,was not not a deliberate act of God? The simply do not know? Do they have direct access to the mind of God that other believers do not have? It seems to me that Paul's words in Romans are more appropriate,"Rejoice with those who rejoice, weep with those who weep",and there are many who weep in Moore. I have searched Piper's blog and not found such a comment. I feel it is important that this article be revised or deleted to reflect the truth. Anonymous - it wasn't on the blog. It was tweet. A screen shot was given, and Piper isn't SAYING he didn't write it. Theologically, Piper's quote of Job was right on. Job didn't do anything to "deserve" what happened to him and his family, any more than the folks in Moore did. But it was just pointless to quote that, especially as .. and I didn't see it when it happened .. the point of Job's innocence wasn't mentioned. For that, I'd fault him, if he didn't explain that. It was just a good time not to say what he did, but then, who among us hasn't passed up a great time to say nothing? I guess the whole point of Wade's post was that it wasn't the time for theological/scriptural quotes. It was/is a time for compassion, prayers, and support. In all fairness, I will confess I've said things I wish I hadn't, but I'll also confess that someone corrected me about the attitude behind my remark. Piper will need to accept the correction that many in the internet circuit are giving. Hannah, I appreciate your expressing your thoughts regarding possible motives for Piper's and Wade's bringing this aspect of Scripture into the Moore tonado tragedy. I believe you are probably correct although we can't know for sure what is going on in another's head. Another good thing about your response is to lead me to consider just how deep the message of Job goes in addressing the dilemma of evil vs grace. Thanks for taking the time. It seems the main topic of Moore, OK has been switched to Piper, Piper, Piper. Is there nothing else important in this world than to discuss the words said by a bias man on tweet if he is guilty or not of using poor judgment? What about the CRIME committed by the IRS targeting Conservative Groups? One Congressman (Republican) said she forfeited her right to the 5th by presenting her case of being innocent without allowing cross-examination. Reminds me of my brother squirting my face with water then yelling ‘King Sakes’—his rule the war he started was over. Jesus had compassion on the people, and fed the hungry 5000. The good Samaritan also got on with the job of giving immediate assistance. 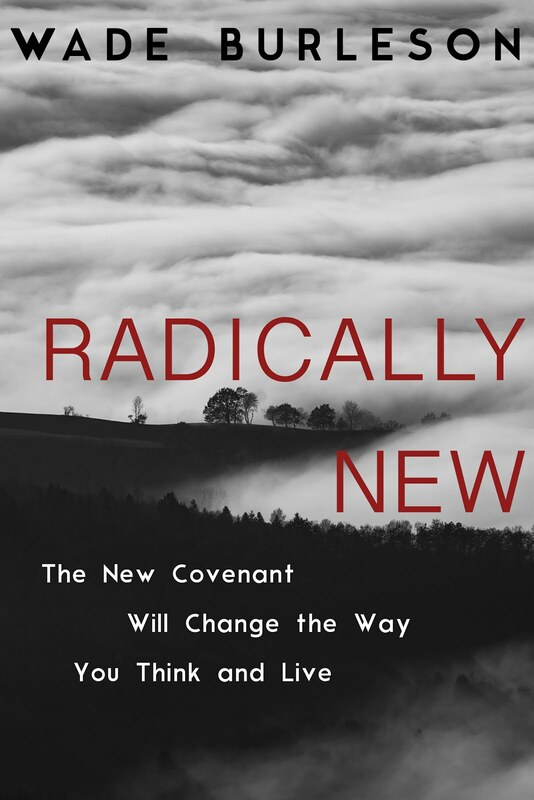 He didn't first have a long theological spiel about the context of the event, or leisurely contemplate upon the who,what, why or when of the situation that confronted him. He unselfishly did what he could do, and promised further help , if needed. And he didn't let the left hand know what the right hand was doing either( Matt 6:3). The immediate need required urgent, practical help, and this is how many people have responded to Moore, possibly Piper as well. Having fed the hungry crowd, healed the sick or raised the dead, Jesus then went further than their physical needs and pointed them to far greater issues in life that required attention. Jesus didn't allow such events to pass without turning their eyes to consider the eternal significance of their situation. Similarly, we ought to engage in BOTH the practical and the spiritual ministry , and in this regard both Wade and Piper are actively engaged. I agree all those things are much more serious than an insensitive tweet by the likes of John Piper. The sad truth is, that ever-growing segment of the population of the U.S., able-bodied people living off the government dole from the cradle to the grave, simply (1) don't know because they don't keep up with the news and (2) they don't care. They simply don't care. I was halfway watching some show last night (it may have been on Fox News or one of Leno's "man on the street" things, I don't remember) where a reporter was asking random people on the street about these current issues in the news. Not a single one had even heard of any of them. The reporter would ask questions such as, "Do you think it would be wrong if the president authorized the IRS targeting Tea Party organizations for IRS investigations?" and a typical response was, "Maybe he had to do it to protect the national security." All in all when presented with the scenario of Obama potentially targeting conservative groups, they were all for it. Some even came right out and said that's a good thing! They had no problem with it. I fear this country has just about reached the tipping point. The outrage among my circle of friends and co-workers and the people you see discussing all this on Fox News is just not present on the MSM channels or in much of the general population. They do not care as long as their bennies keep coming. Take away their free government cell phones, and that would get their attention in a hurry. I'm sure most people have heard of "Watergate." I doubt many, especially younger people who didn't live through it, could tell you what it was about, but "Watergate" is part of our lexicon. That didn't amount to a hill of beans, but because of the cover-up afterwards, Nixon resigned, and people went to prison. Today when the president lies and things are covered up, all we here is a collective "so what?" and an ad nauseum string of "I don't recalls" from government officials, and this is a whole lot more egregious than Watergate. As for Piper, how can anyone take that man seriously? I'd never heard of him until a few years ago when I began seeing Southern Baptists gush over him. My introduction to Piper was through the CBMW and that thick book he and Grudem wrote... something about "defining manhood and womanhood," almost half of which consisted of the bibliography. That book should be enough said right there. I watched a recent episode of 19 Kids and Counting, the TLC show about the Duggars, the NW Arkansas family with 19 children who are followers of Bill Gothard, another one who makes me wonder how anyone could take him seriously. In that episode, one of their sons was preparing to leave home for nine weeks to attend Gothard's A.L.E.R.T. Academy training in Big Sandy, TX. (You would have thought he was being deployed to Afghanistan the way they were all carrying on.) It's kind of like Boy Scouts (of course, "girls" need not apply as manly man things like this are not part of young ladies' "biblical roles"), but while out in the field tying knots and practicing rescue techniques, they make the boys stop periodically and "legibly write" whole chapters from the Old Testament. It's actually kind of bizarre. Anyway, for all their bloviating about how they're preparing these young men to help out in the aftermath of natural disasters, their websites have been conspicuously quiet about the Moore tragedy or really anything else they're doing in the "real world." I hope this just means they're working quietly behind the scenes, but since historically they've enjoyed the spotlight quite a bit, it makes me wonder. Someone said Piper's tweet sounded like something Fred Phelps of Westboro BC would write. I concur.